WE DO FRESH AND FAST. AND WE'VE DONE IT FOR 30 YEARS. Baked throughout the day and famous for our freshness, we are THE baguette specialists. We launched our first site in Waterloo Station in 1986. Since then we have grown to over 100 stores all around the world and have perfected our recipe for deliciously crispy, crunchy baguettes. We promise that your baguette will be freshly baked and generously hand filled with the tastiest and best ingredients we can find. Our coffee is hand crafted by our trained baristas, perfect alongside one of our freshly baked pastries. Next time you’re in an airport or a railway station, you’ll find us there. The freshest baguettes plus the tastiest snacks and coffee, all made to travel. At Upper Crust, we promise you a freshly baked baguette generously filled with mouth-watering ingredients. Every ingredient chosen is the tastiest and best we can find. 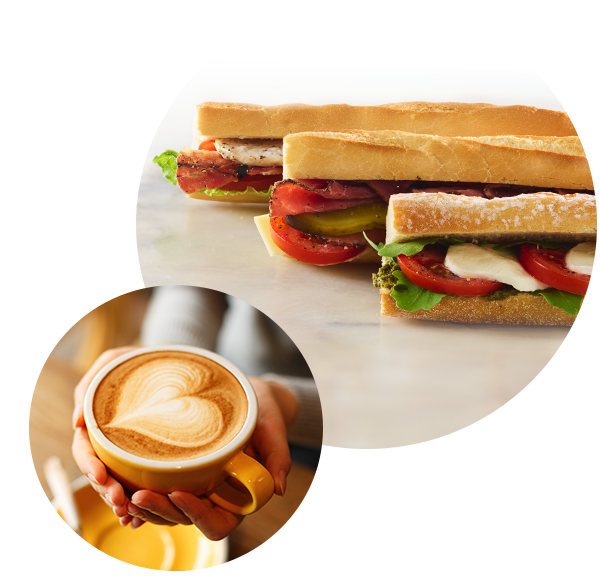 Throughout the day you'll find our famous baguettes complemented with a range of delicious breakfast options plus pastries, sweet treats and expertly brewed barista coffees and teas. Freshly baked, generously filled by hand and perfectly suited to eating on the move. No wonder our baguettes are so popular. Baguettes may be our specialty but most of our stores also offer additional hot choices. Perfect for something more substantial in the evening. Our expert baguette bakers are also rather good at creating delicious sweet and savoury pastries. The most important meal of the day, or so they say! We've something to suit all tastes at breakfast time. As you'd expect, our coffee is a cut above the rest. At Upper Crust we pride ourselves on great service with a team who are fast, efficient, knowledgeable and always serve you with a smile. If you’ve visited us recently, tell us about your experience here For all other queries give us a call on 0207 529 8369. Lines open Monday to Friday, 9:00-17:00. If you share our passion for fresh baguettes and tasty coffee, join our team. © 2019 Upper Crust. All rights reserved.